Wow, too bad this repair was already scheduled we had some snow today. Maybe if they get here soon enough I can get out and shoot. I brought my laptop and a book on Photoshop Layers to the rental house to play and learn a little bit more on techniques. 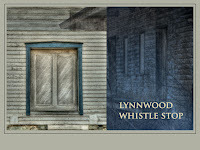 Here is a series of images I worked with to get the Lynnwood Whistle Stop Poster, I just loved that little town and its abandoned depot. Now I see why graphic designers spend lots of time working on one project. This was just play but it does take a long time to step through the process. First: capture the images: Then process them in Photomatix individually and do adjustments on them in Photoshop individually. Then bring them all into Photoshop again and work with layers to get the poster..combo. I don't know what I'd ever do with this but it is a learning process. The other thing I find is the amount of files I am keeping on a single image can become very confusing: First all the raw files, then the tone mapped files, then the adjusted Photoshop files, then the re-sized files then the final files...I have to work out a system for that!